....This means our perfect team includes you!" We, the company owners and happily married couple, Jon Joel Einarsson and Maggy Magnusdottir, will most likely be your guides for your GoWest Experience. Both of us are extremely experienced outdoor enthusiasts, with family roots firmly embedded in the western part of Iceland for several past generations. We have substantial expertise in guiding, gained through a long experience of Icelandic outdoor life and excellent knowledge of our local nature and culture. We can't wait to share both our experience and culture with you! Jón has a diverse background within humanities from his university studies and working life in Iceland, Norway and USA. He has education in theater, literature, philosophy, creativity, Icelandic, pedagogy and of course Glacial Guiding. He has been enthusiastic about nature and environmental issues for many years and passionately believes tourism has an immense power to positively influence sustainability. He is a certificated Wilderness First Responder and has been through a crevasse and mountain rescue training with Fjallaskólinn. Maggy is GoWest´s caring mistress. She has a degree in Social Work from her University life in Norway and has a wealth of experience within family consultation, youth work, rehabilitation and leading trade-union business. She is one of three founders of a successful outdoor educational program called Hálendishópurinn, which focused on helping youths at risk. An Icelandic Sheep Dog/Border Collie cross, our Salka is 4years old, loves kids and humans but for some strange reason doesn´t like cats as much. Her favourite things are outdoor life and playing in the snow. If you love dogs as much as Salka loves humans, then do tell us because she would be more than happy to join your tour....FOR FREE. Please send us a note (gowest@gowest.is) and we will check her availability. Orsi is has been guiding with us since 2015 and is certified in Mountain/Glacial guiding and Sea Kayaking making him equally at home in the water as he is in the mountains. He is a member of both the Association of Icelandic Mountain Guides and the Iceland Tourist Guide Association , focusing on both his clients safety and happiness. For additional safety he is now a certificated Wilderness First Responder. With over 20years of experience, working with all types of outdoor enthusiasts from all over the world, we are very lucky to have him on our team. He loves to share stories and coffee but be careful, he tends to burst into song without warning. Gaui has been a man of the outdoors since childhood, climbing and skiing mountain tops in both Iceland and abroad. 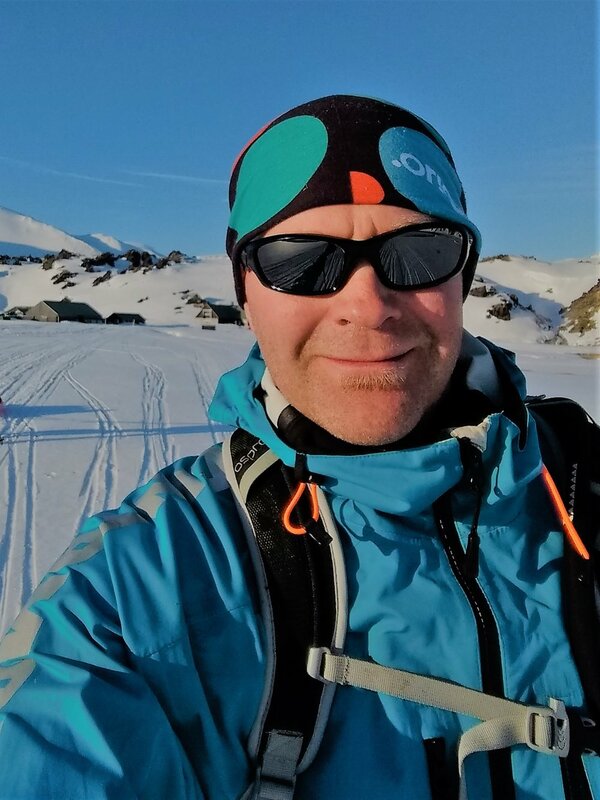 He is a member of the Icelandic Search and Rescue team (Icelandic SAR) since 2011, has a wilderness first responder certificate, a Divemaster´s certification. This year he climbed Asia´s highest peak Mt Damavand at 5,610m. Tryggvi has his degree in resources economics. He has also received education and a diploma as a guide for tourists at the University of Iceland. As young boy Tryggvi joined the scout movement and learned to appreciate the wonders of Icelandic nature through active outdoor life. As a 15-year-old he made his first walk to the top of Snæfellsjökull, guided by his uncle. Over the years Tryggvi has gained experience leading number of groups hiking through the highlands of Iceland. Until recently, Tryggvi worked as a political advisory in environmental protection, resource management and nature conservation, for the Nordic Council, located in Denmark. Language skills: English, Scandinavian and some Spanish and German. Gerhard is a sculptor currently living and working in Iceland, (yes, this crazy volcanic island in the North Atlantic). Before moving to Iceland he lived, studied and worked in Germany and Switzerland. His website GerARTworks contains all practical information about him as an artist working with various mediums and an art-teacher for many years. - He is enthusiastic about working with people, schools and institutions. Haraldur is not just one of our guides but also a world Famous Volcanologist. Awarded the Exploration History Award for his scientific commitment and writings on volcanology: Leif Erikson Awards 2017. When his time isn´t taken up by being active in various Geological Research projects we love to have him guide. He is very experienced in the mountains and is actually the founder of the Stykkishólmur VOLCANO MUSEUM. Ingþór is a physiologist with a broad background. He is an expert in ...therapy and how nature can play an extremely important role in our healing process. He has incredible Glacial experience, journeying over Greenland, the South Pole and towards the North Pole. Þorsteinn is a glaciologist working at the Icelandic Meteorological Office. Global warming and it´s effect on glaciers is a major concern for us and we are lucky to have Þorsteinn educating our guests on the status of melting and retreating glaciers in Iceland. He is helping us to understand the big picture and importance of the glaciers in our lives.